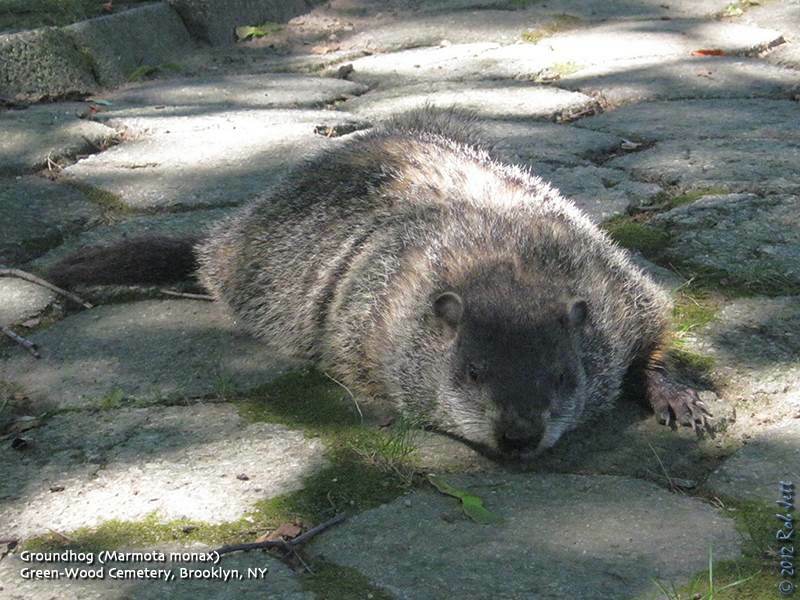 I spotted this Groundhog taking a nap in Brooklyn's Green-Wood Cemetery. I suspect that he was roused from sleep in his den by a team of landscape workers nearby. The shade from a stand of large oaks and the cool paving stones must have felt good in the 90+ degree mid-afternoon weather. This large squirrel is native to North America and Green-Wood Cemetery is one of only a few places where remnant populations can still be found within New York City. Ocean Power Technologies Inc. received permission to build the first commercial wave-power plant in the U.S. The Federal Energy Regulatory Commission issued a 35-year license for the company’s planned 1.5-megawatt power project about 2.5 miles (4 kilometers) off the coast of Reedsport, Oregon, Ocean Power said today in a statement. The approval validates the Pennington, New Jersey-based company’s technology to convert the motion of the sea into electricity and may lead to additional commercial marine-energy projects, said Chief Executive Officer Charles Dunleavy. “The 35-year term of the license demonstrates the commercial potential of wave power, and this will support initiatives to secure financing for the project,” he said in the statement. The project comprises 10 of the company’s PowerBuoys tethered to the sea bottom which generate power as waves and tides move them up and down. It will generate enough power for about 1,000 homes, according to Ocean Power. Ocean Power shares rose 6.4 percent to $2.51 at the close in New York. The first PowerBuoy, which received funding from the U.S. Energy Department, is expected to be installed this year. Sunday, September 2, 8 a.m.
Alley Pond Park, 76th Ave.
For directions, click sitefinder view. We encourage carpooling where feasible. 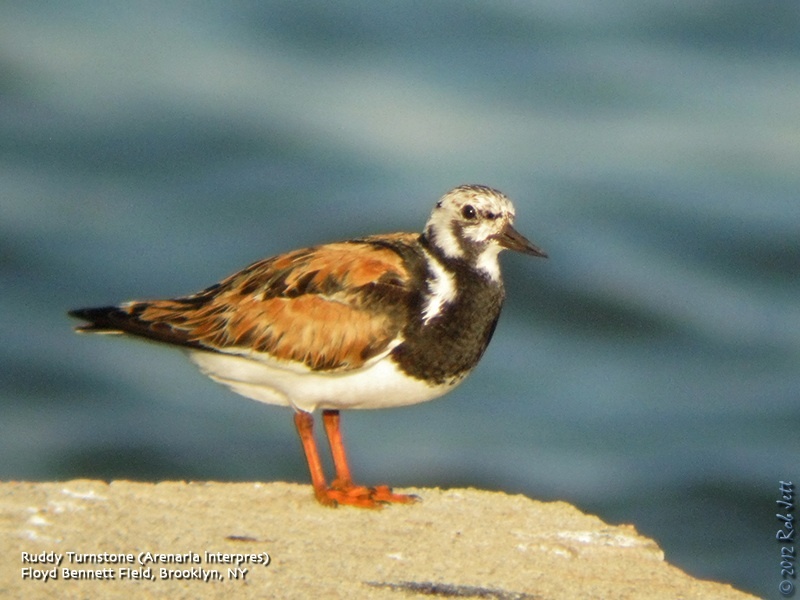 The Ruddy Turnstone is one of two species of turnstone found in North America. Breeding in the Arctic tundra, they winter as far south as the southern tip of South America. Around New York City this common, distinctive shorebird can be seen on migration at most coastal locations. They can also be found in the Eastern Hemisphere where they are referred to as just the "Turnstone". Last weekend's Brooklyn birding revealed a few surprises and added a couple of new species for my yearly Brooklyn list. My friend Sean was leading the annual event at Jamaica Bay Wildlife Refuge on Saturday. Both Heydi and I had planned on attending, but weather forecasts sounded bad. Thunderstorms were predicted throughout the night and into the early morning. It's one thing to be outdoors in the rain and something entirely different looking through a scope through a curtain of blur at shorebirds that are already difficult to identify. I decided not to go and texted Sean the night before. By around 9:00am the rain began to slow so I started to pack my gear on my bike for a ride down to Floyd Bennett Field. 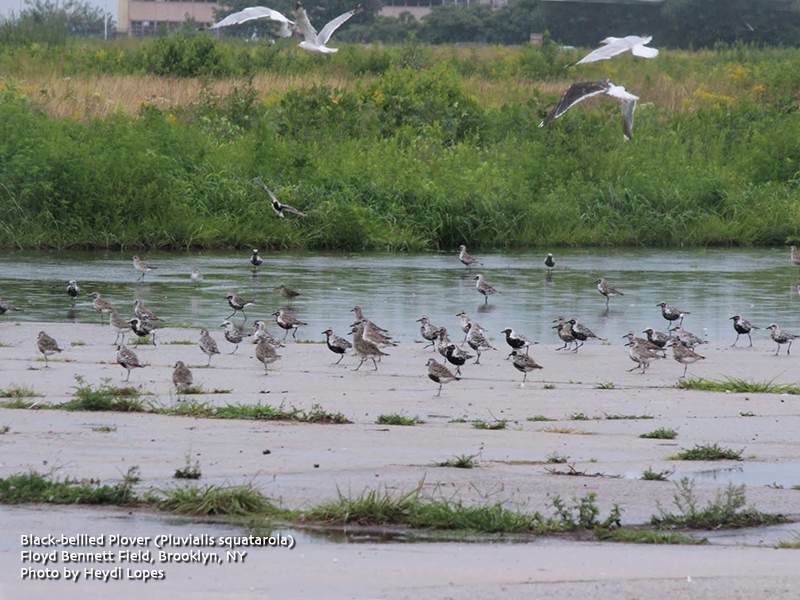 Heydi was already there and texted that there were lots of Black-bellied Plovers at the temporary puddles along all the runways. A short while after, she send another message that there were a few golden-plovers present, as well. By this time the rain had slowed to a drizzle, so I hopped on my bike and headed up the block. About ten seconds into my ride I heard air hissing from my rear tire, stopped to examine the rubber and found a small piece of glass sticking out of the tread. Crap! Repairing the flat cost me about 15 minutes and I hoped that the American Golden-Plovers stuck around until I arrived. 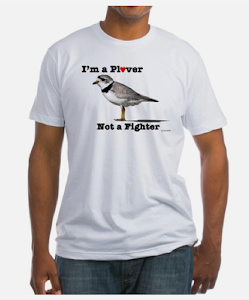 I called Heydi to let her know I was delayed and asked for exact directions to the plovers. On a good day (and with rare bird motivation) it takes me about 30 minutes to ride from my apartment to Floyd Bennett Field. Saturday was a good day and when I arrived I headed straight to the recently mowed "Field A" to scan for golden-plovers. It took me less than a minute to spot one of the birds, then they took off flying. Heydi was walking across the parking lot from Aviator Sports towards the fields. I pedaled over to give her the news, but she had seen them fly and the two of us stood in the parking lot following the flight path of these dark plovers with our eyes. The birds alternately flew out over the large parking lots and Floyd Bennett's grass fields crisscrossed with old concrete runways. They eventually came down at the edge of the field directly opposite the Ryan Visitor Center. 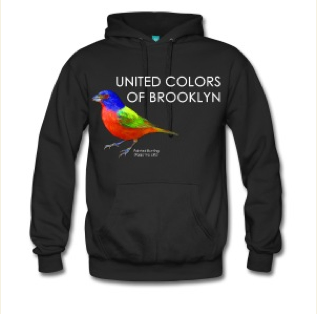 We probably spent about 15 minutes watching these relatively rare visitors to Brooklyn. Earlier I had sent out a text alert about the sighting and expected that other birders would be showing up shortly. We left the nervous birds to forage along the edge of the grass and headed over to Dead Horse Bay. 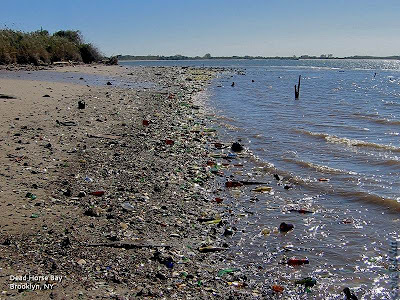 The broken glass-encrusted beach along Dead Horse Bay is an unexpected place to find shorebirds, not so much because the habitat is wrong, but because it looks so undesirable for creatures with delicate, little feet. In spots it appears that there is actually more glass than sand blanketing the beach. I suppose that there are still plenty of insects, worms and other marine creatures thriving in the almost-sand because the shorebirds are eating something. 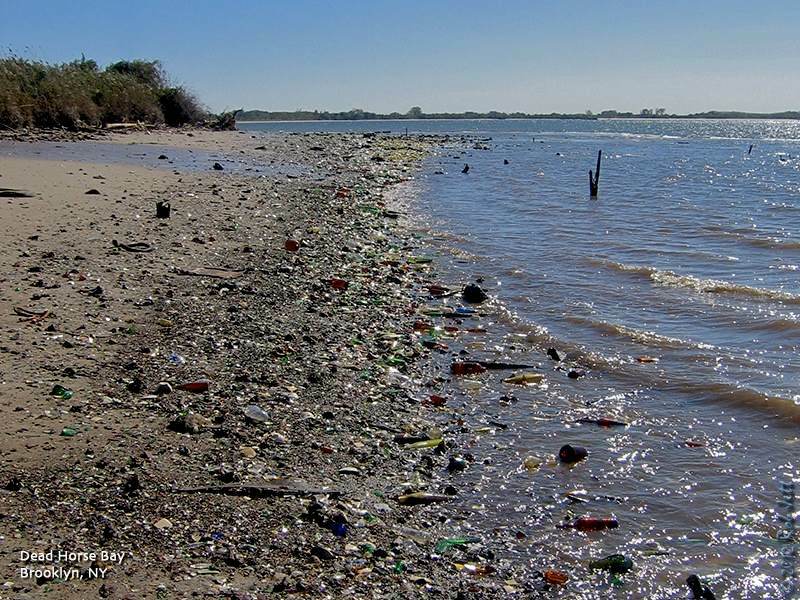 I'm concerned about any toxins leaching out of the old landfill and into the environment. Along some stretches of this beach the odor of heating oil is unmistakeable. I imagine that the action of the wind and waves will eventually turn all that glass back to sand, but I won't be here to see it. We were hoping to find some Red Knots foraging among the glass, but instead counted our all time high number of Brooklyn Ruddy Turnstones - 43. In addition to the turnstones there were 37 oystercatchers, nearly half of which were juvenile birds. American Oystercatchers are successful breeders along the Rockaway Peninsula and I assume many of the birds we saw on Saturday just flew across Jamaica Bay to feed on Dead Horse Bay's tasty, toxic tidbits. 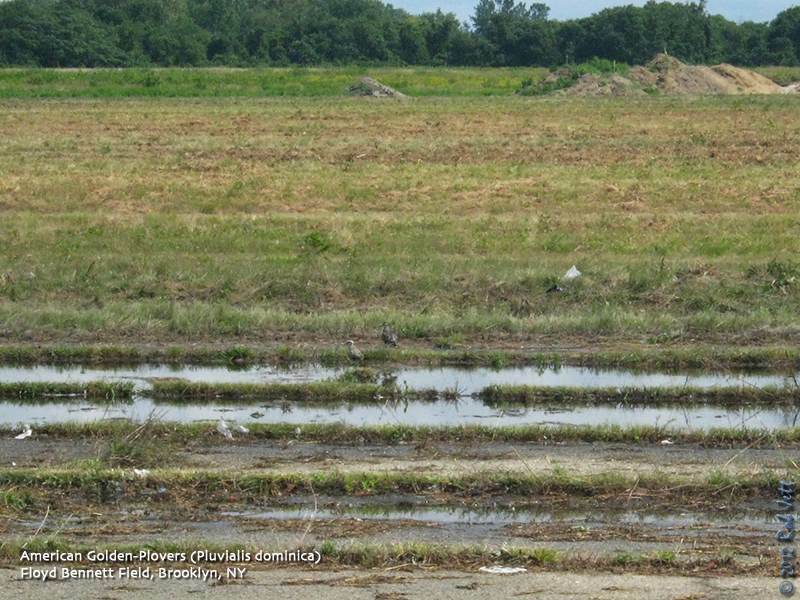 We returned to Floyd Bennett Field to have some lunch then scour the fields one more time for "grasspipers". As we walked across the main runway Heydi received a text from Andrew requesting details on the location of the golden-plovers. I was surprised that he was the only birder that came out looking. A short while later we spotted Sean with the remains of his Jamaica Bay Wildlife Refuge group, as well as, Tom and Gail. All had located the plovers and were very happy. Tom also reported seeing a Pectoral Sandpiper, although it had flown off before Heydi and I arrived. 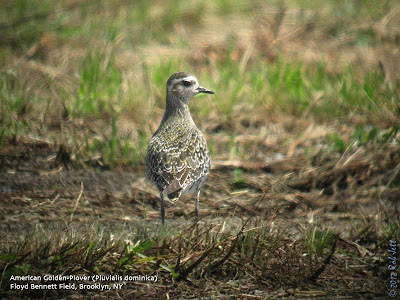 It was nearly low-tide and the flocks of Black-bellied Plovers seen earlier in the morning had taken off to forage on the now exposed flats within Jamaica Bay. I suppose that is also where I might have found the Pectoral Sandpiper. North winds at night during the Fall migration is usually an indication that there will be lots of birds the next morning. I was convinced that Prospect Park was going to be loaded with birds on Sunday and arranged to meet Heydi and Paige at first light at Grand Army Plaza. 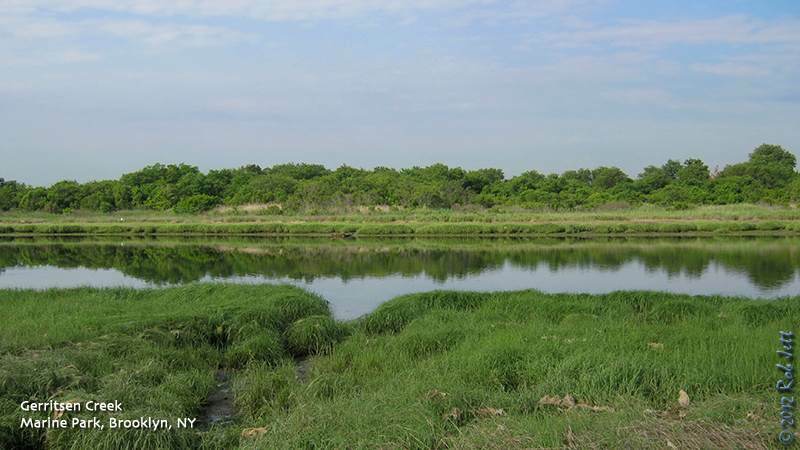 By morning Paige decided to go to Jamaica Bay Wildlife Refuge instead to search for some recently reported rarities. She texted me at around 7am to find out how the activity was in Prospect Park. I think my exact words were, "So far it sux." Up to that point, the north end of the park was virtually devoid of birds. We had seen only one warbler, a Canada Warbler, and very few of the resident birds. That would all change, though, as we approached the Nethermead Meadow. Just below the intersection of Center Drive and the Ravine Path there is a small stand of mature oak trees at the edge of the Nethermead. As we descended the Ravine Path I heard first a chickadee, then a titmouse vocalizing near the top of one of the oaks. We walked towards the base of the tree and began scanning for the birds. There was a lot of bird activity in that tree and, in addition to the chickadee and titmouse, we quickly tallied Warbling Vireo, Blue-gray Gnatcatcher, Black-and-white Warbler, American Redstart, Northern Parula, Magnolia Warbler, Chestnut-sided Warbler and Baltimore Oriole! The flock flew across the road to the woods along Quaker Ridge. We followed and walked along the parallel bridle path towards the Quaker Cemetery. Eventually we wound our way up onto Lookout Hill were we found even more bird activity. We spent about an hour there circling the Butterfly Meadow, the top of the hill, then down the south stairway and along the upper Wellhouse Path to the Maryland Monument. I wanted to head out onto the Peninsula and the wooded section there, but there were too many unleashed dogs running around and opted instead to walk over to Green-Wood Cemetery after a short break at Connecticut Muffin. There was a bit of warbler activity at Green-Wood Cemetery, but nothing unusual ... mostly lots of American Redstarts. At the Sylvan Water a young Glossy Ibis was feeding along the edge of the pond in front of Fred Ebb's mausoleum. Ibis are relatively unusual in the cemetery and, given the location, I had a sudden urge to start singing "New York, New York." Our 2 1/2 hour meander in the cemetery paid off with one very nice highlight. We were heading towards a small valley near Boss Tweed when I heard a distinctive, "tu-wee" call of a Yellow-bellied Flycatcher. I ran towards the sound of the bird. It called nearly non-stop as it hawked for insects at a stand of mature deciduous trees near the Pierrepont family memorial. This small empidonax flycatcher is easily distinguished from the other similar flycatchers in the Spring by its very yellow undersides. Unfortunately, in the Fall, nearly all the empidonax flycatchers appear to have a yellow wash on their undersides. Luckily, the bird in the cemetery was vocalizing continually and his call is unique and easily differentiated. 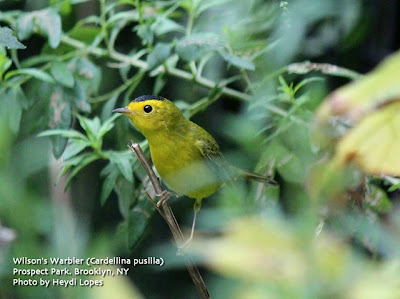 Shortly after finding the flycatcher we received a text from Peter that a Golden-winged Warbler was spotted on the Peninsula in Prospect Park. I wrote back asking when. He responded, "Right now." It would take us 30 minutes to walk back from the cemetery to the Peninsula. 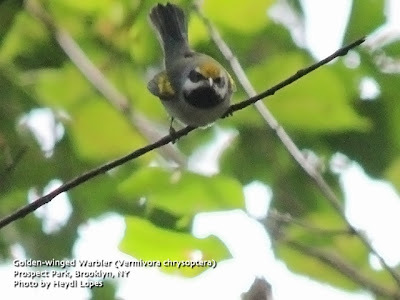 I hadn't seen a golden-winged in Brooklyn in nearly 10 years, so it was worth taking a chance and hightailing it back. Once on the wooded end of the Peninsula we saw Adam, Keir and Tom, who had been following the golden-winged. They explained that it had been feeding low in the understory, occasionally feeding right on the ground, but they had recently lost sight of it. Heydi and I split off from them determined not to leave the park until we relocated the bird. We started to sweep back and forth across the narrow finger of land that juts into the park's lake. A few minutes later Keir texted that there was a Cape May Warbler in a pine tree at the end of peninsula. We reversed course. The cape may was easy to find and while we were looking at it I asked the guys if the Golden-winged Warbler was associating with any other birds. They replied that it was within a small flock that included a pair of Chestnut-sided Warblers. We left to continue the search and to keep an eye out for the chestnut-sideds. Golden-winged Warblers tend to favor areas of low, secondary growth, so that was where we concentrated our search. We had made our way around the Western edge of the forest and were walking into the central area along a dirt path when Heydi shouted, "There it is!" The brightly colored male bird was feeding on insects only about 12" off the ground (the photo doesn't do justice to this lovely bird). A group of about 8 other birders were scanning from a parallel path about 20 yards away so I shouted to them that we had the bird. Everyone came running. A couple of folks were even pushing strollers. More text alerts were sent out. The bird remained in the area feeding very close to the ground and being extremely cooperative for fourteen or more birders. It was the best study I've ever had of this bird. In addition, a pair of the closely related Blue-winged Warbler were feeding in the area. 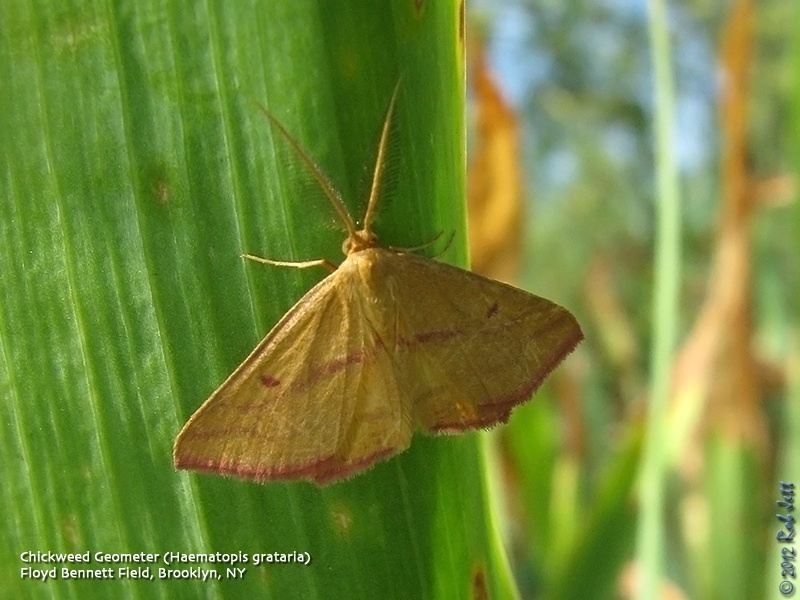 These two species will sometimes hybridize, possibly contributing to the decline of golden-wings. After about an hour on the Peninsula, Heydi and I had the crazy idea that we could scour Prospect Park one last time and, with a little luck, add one or more species of warbler to our already crazy day list. We headed up to Lookout Hill in search of a Prairie Warbler that was seen there earlier. On our way up the stairs behind the Maryland Monument, Heydi picked out a Worm-eating Warbler in the canopy. At the top of the stairs, walking towards the Butterfly Meadow, I spotted the Prairie Warbler feeding low in a patch of Polkweed and Jerusalem Artichoke. That brought our warbler total, including a Blackpoll and Pine Warbler seen in Green-Wood Cemetery, to 18. At this point we were starting to wind down the day and head back to where we started at the North end of the park. Walking through the Ravine we encountered another birder, whom I didn't know, and we compared warbler notes. We directed him up to Lookout Hill for the worm-eating and prairie, he directed us to the Nethermead Arches for a Wilson's Warbler. From the photo, you know we found the wilson's. The bird was sitting out on a low fence near the edge of the stream. After the bird took off we contemplated which other warbler species were possible on such an early date. One bird that I was surprised we hadn't seen all day was a Black-throated Blue Warbler. We were about 20 minutes away from ending our day and continued North along the bridle path as it followed the stream through the Ravine. About 50 yards passed the Nethermead Arches, there it was - a Black-throated Blue Warbler and our twentieth warbler species of the day. We both tried to take a photo of it through the chainlink fence that separates the horse path from the Ravine's stream. Neither bird nor cameras cooperated. Sitting on a park bench at the Vale of Cashmere we recounted our day's unbelievable discoveries. Was it really August? The abundance and diversity of warblers that we had experienced seemed more typical for a day during Spring migration! And a good one, at that! I can't wait until the next cold front. A study by the University of Utah of "Shade" plantations indicates that wooded plantations promote greater bird diversity. That greater diversity has numerous environmental and economic benefits. Aug. 7, 2012 – Compared with open farmland, wooded “shade” plantations that produce coffee and chocolate promote greater bird diversity, although a new University of Utah study says forests remain the best habitat for tropical birds. The findings suggest that as open farmland replaces forests and “agroforests” – where crops are grown under trees – reduced number of bird species and shifts in the populations of various types of birds may hurt “ecosystem services” that birds provide to people, such as eating insect pests, spreading seeds and pollinating crops. “We found that agroforests are better overall for bird biodiversity in the tropics than open farms,” says study author Çağan H. Şekercioğlu (pronounced Cha-awn Shay-care-gee-oh-loo), an assistant professor of biology at the University of Utah. Şekercioğlu’s new study, funded by the University of Utah, is being published this month in the Journal of Ornithology. He will present the findings Thursday, Aug. 9, at the Ecological Society of America’s annual meeting in Portland, Ore. He adds: “There are trustworthy environmental organizations that certify shade coffee,” including the Smithsonian Institution, the Rainforest Alliance and the Rainforest Action Network. “The global analysis of all the birds species mostly agrees with the findings of detailed local bird studies,” Şekercioğlu says. The findings suggest, but don’t prove, that conversion of forest to farmland may reduce ecosystem services, which are services birds provide to people. • Insectivores or insect-eating birds do best in forests – especially those that live near the ground in the understory, the layer of plants below the tree canopy and above the ground cover. But small and medium insect-eating birds, especially migrant and canopy species, do well in agroforests. 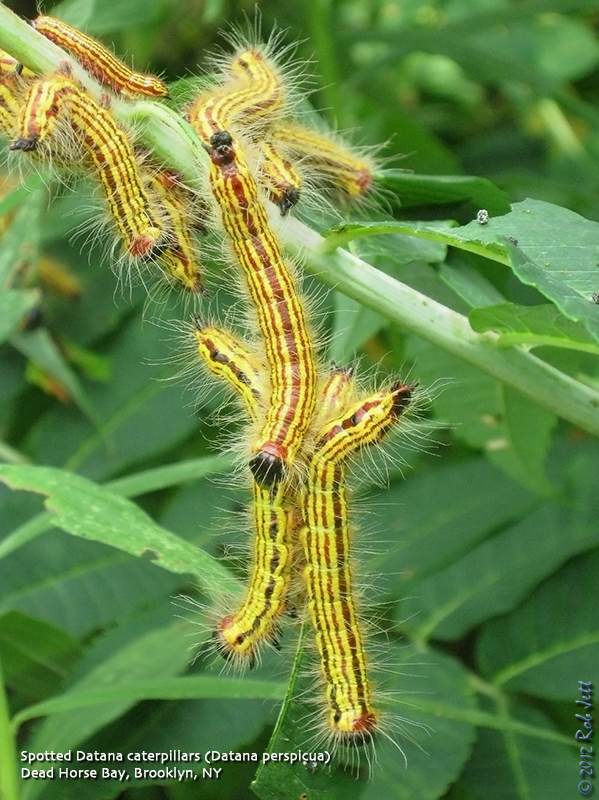 The number of insect-eating species declines on open farms, where they help control pests. • Frugivores or fruit-eating birds, especially larger ones, “do best in forest because they have more habitat and more food, and the large ones often are hunted outside forests in agricultural settings. Overall, frugivores – especially smaller ones – do OK in agroforests, but the number of fruit-eating species decline significantly on open farms.” Frugivores help spread the seeds of the fruits they eat. • Nectarivores or nectar-eating birds help pollinate many plants. They “tend to increase in agroforests compared with forests. A lot of nectar-eating birds obviously like flowers, and many plants flower when there’s some light. When you have extensive forest its often pretty shady so not many things are in flower at any given time.” The nectar eaters are less common on open farms. • Omnivores, which are birds that eat many things, “tend to do better in agroforests and especially on open farms” than in forests, because their diet is so generalized instead of specialized in certain foods. While the study found fewer species on farms than in agroforests, and fewer on agroforests than in forests, Şekercioğlu says it doesn’t answer a key question: “Does the decline in the number species translate into a decline in individuals providing a given ecosystem service?” If so, farms and agroforests have lost birds that provide important insect-control, pollination and seed-dispersal services. But fungi can be a problem in humid shade coffee plantations, and growers have come up with varieties that grow well in the sun with less fungus and bigger yields, so in recent decades, there has been a trend toward converting Central and South American shade-coffee forests to open farms, Şekercioğlu says. Annual SHOREBIRD FESTIVAL at Jamaica Bay Wildlife Refuge. Guides and Speakers: Don Riepe, Lloyd Spitalnik, John Rowden, Kevin Karlson Join us at Jamaica Bay Wildlife Refuge for the 7th Annual Shorebird Festival. 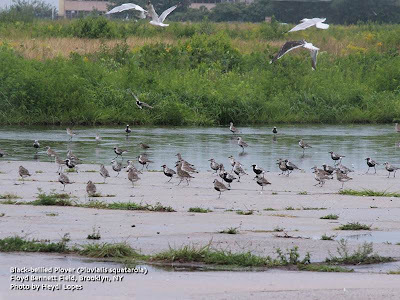 Learn about shorebird biology, behavior and identification. The program is free and open to the public on a reservation basis. Click here to learn more. Sunday, August 26, 2012, 10:30 a.m. to 12:30 p.m.
Join historian and naturalist Mike Shanley on a walk through North Mount Loretto State Forest. Mike will be discussing the history of the area while searching for birds and other wildlife. Meet at the North Mount Loretto State Forest DEC parking lot on Amboy Road in Richmond Valley. Sunday, August 26, 2012, 11 a.m. to 1 p.m.
We will explore the Greenbelt including parts of Pouch Camp to observe all the different plants and animals of a unique woodland and its meadows, streams and ponds. Be sure to bring beverage, binoculars and field guides. Meet at the Greta Moulton Gate at the top of Nevada Avenue. We go in all weather. Greetings. This is the New York Rare Bird Alert for Friday, August 17th, at 7:00pm. The highlights of today's tape are BROWN PELICAN, AMERICAN WHITE PELICAN, LARK SPARROW, DICKCISSEL, MANX SHEARWATER, MARBLED GODWIT, and UPLAND SANDPIPER . It was a good week for pelicans, with both North American species putting in appearances. First, last Saturday on a rising tide, two BROWN PELICANS flew into Jones Inlet and spent a couple of hours around the bar, in the inlet across from the West End Coast Guard Station. They then at about 1pm flew out of the inlet, apparently moving west past Point Lookout, but on Wednesday perhaps it was the same two pelicans reported flying east past the West End Boat Basin, so they could be continuing in the area. On Tuesday, an AMERICAN WHITE PELICAN dropped in on the East Pond at Jamaica Bay Wildlife Refuge, spending time at the north end of the pond before flying off to the southeast. The pelican also appeared back at the north end of the East Pond Thursday and Friday at high tide, so it too seems to be hanging around. A CASPIAN TERN visited the East Pond Saturday afternoon. Among the shorebirds, numbers have been somewhat low lately, with some juveniles beginning to appear, and two or three LONG-BILLED DOWITCHERS continuing on the East Pond. Also at Jones Beach West End, an immature LARK SPARROW was hanging around the West End 2 parking lot from Thursday the 9th through last weekend, but we have no reports since Monday. Two subadult LESSER BLACK-BACKED GULLS were in the West End 2 parking lot Saturday afternoon, and the numbers of Lessers grew to eight in the lot on Wednesday. A sea watch off West End 2 late Saturday afternoon produced one WILSON'S STORM-PETREL and one MANX SHEARWATER, with this Manx, or a different one, also occurring off Jones Beach field 6 an hour later. A BLACK TERN also visited the West End Saturday. On Tuesday morning a MARBLED GODWIT appeared on the bar off the West End Coast Guard Station, and a DICKCISSEL was with House Sparrows around the rest rooms near the Coast Guard Station. A WHIMBREL was among other shorebirds at the West End early in the week, and a GULL-BILLED TERN visited the Coast Guard sandbar on Wednesday. At Heckscher State Park, some rain pools around a few of the parking lots have been attracting a decent variety of shorebirds, including a WHIMBREL that has spent the last three days near field 7. Other sandpipers at Heckscher have featured up to seven or more PECTORAL SANDPIPERS, a STILT SANDPIPER, and three SOLITARY SANDPIPERS. An UPLAND SANDPIPER was also reported there recently. An UPLAND SANDPIPER flew over the golf course in Calverton on Wednesday, and BLACK-BILLED CUCKOO was at nearby Sandy Pond. Out at Cupsogue County Park in West Hampton Dunes, decent numbers of shorebirds on the flats featured three WILSON'S PHALAROPES reported Thursday afternoon, with a WHIMBREL there earlier. A CASPIAN TERN was at Cupsogue Thursday, and there are now about 20 ROYAL TERNS between there and adjacent PIKE'S BEACH. A few WHIMBREL continue on the North Fork at Cedar Beach County Park in Southold. The KENTUCKY WARBLER was heard again Thursday at the Rocky Point DEC field off Route 25A after a long quiet period. A reasonable number of warblers and other migrants came through earlier in the week, some of the more notable species including COMMON NIGHTHAWK, ORCHARD ORIOLE, and BOBOLINK, while among the warblers were BLUE-WINGED WARBLER, NORTHERN PARULA, MAGNOLIA WARBLER, BLACK-THROATED GREEN WARBLER, BLACKBURNIAN WARBLER, CHESTNUT-SIDED WARBLER, PRAIRIE WARBLER, BLACK-AND-WHITE WARBLER, WORM-EATING WARBLER, OVENBIRD, CANADA WARBLER, and even a couple of MOURNING WARBLERS noted from Central Park and Marshlands Conservancy in Rye. 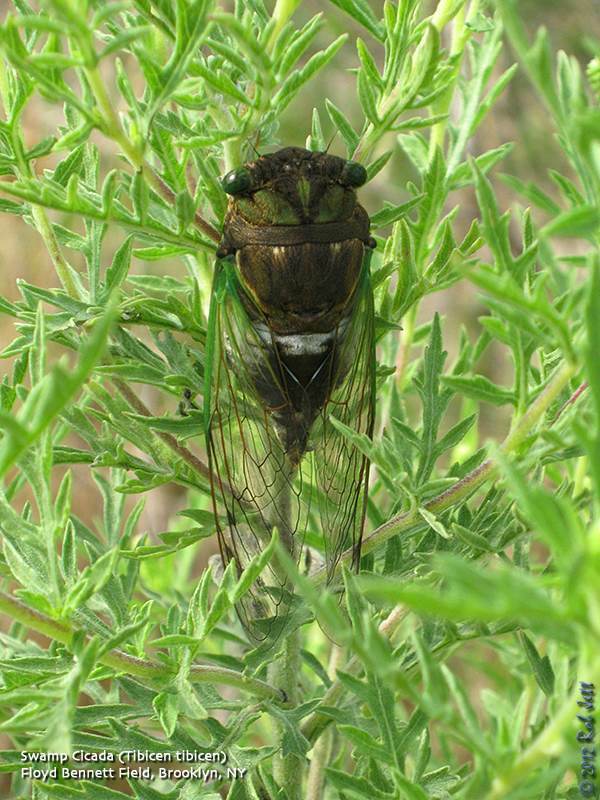 Just as I do with birds, I've been trying to learn to identify cicadas by their songs. Lang Elliott and Wil Hershberger's excellent guide (with accompanying audio CD), "The Songs of Insects", has been a valuable tool. What I've learned about Brooklyn, so far, is that of the 6 expected species of cicadas the Swamp Cicada is the most prevalent summer sound. 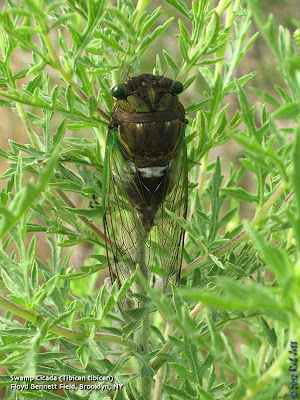 For more information about cicada's check out Lang Elliott and Wil Hershberger's online guide. National Public Radio recently broadcast a really informative, two part series on how thousands of migrating birds are killed by window strikes every year. In the second part they looked at ways in which some architects are trying to design buildings that minimize or eliminate bird collisions. Saturday, August 18, 10 am–3 pm. Depart Bylane at 8:45 am. Saturday, August 18, 2012, 10 a.m. to 12 p.m.
Meet with herbalist Gert Coleman in the Colonial Herb Garden at Conference House Park to identify herbs and learn their culinary, medicinal, household, and cultural uses throughout the years. Weather and time permitting, we will stroll through the park to identify “wild” herbs and other useful plants. Meet in the parking lot at the foot of Hylan Boulevard. Saturday, August 18, 2012, 10 a.m. to 2 p.m.
Meet at the side of Meisner Avenue (toward the Eger Home) close to the intersection of Meisner and Rockland. We will follow the Red Trail below the Golf Course into Buck’s Hollow where we will remove twining vines and perhaps uproot or weed-whip Japanese Stiltgrass. Protectors will supply tools, gloves and refreshments. After a two hour work session (our 194th consecutive monthly workshop), we will take a short walk over nearby trails. The House of Representatives has passed a bill authorizing the industrial use of Gateway National Recreation Area. 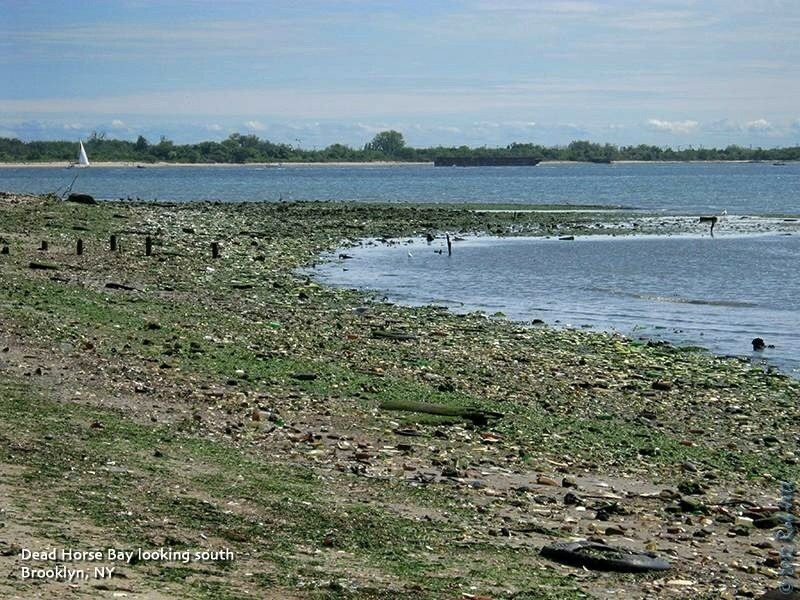 The proposed high pressure gas pipeline will go directly under the beach at Jacob Riis Park, under protected wetlands in Jamaica Bay, and the proposed metering station in Floyd Bennett Field will be only yards from the community gardens! • Turns over land held in the public trust to private industrial use. 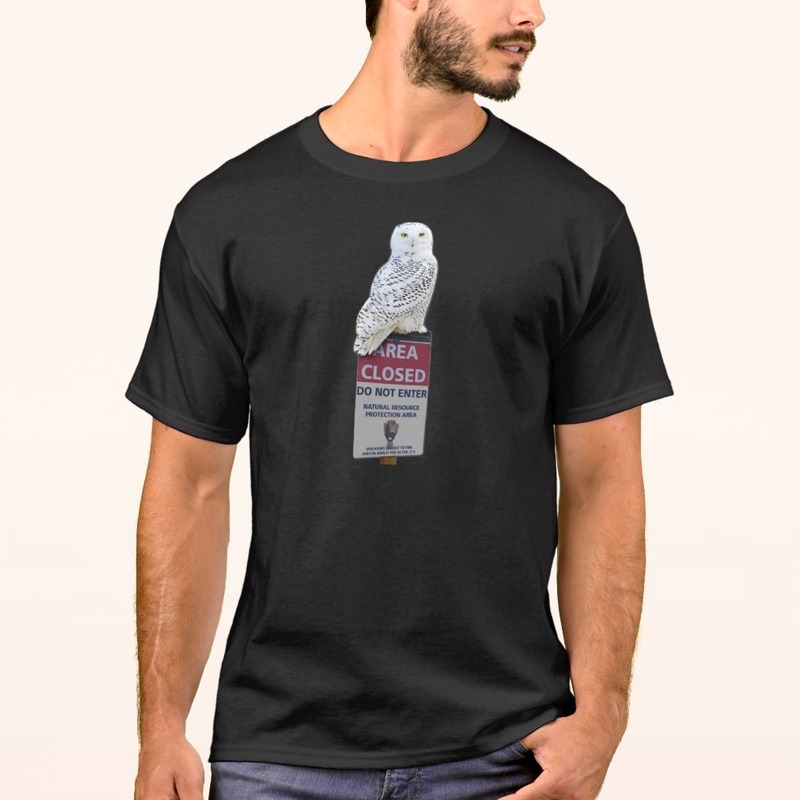 • Threatens wildlife, wetlands, and sensitive ecosystems. • Puts park users and area residents at risk. • Promotes hydrofracking and the use of shale gas. A petition has been created to send to Sen. Charles Schumer (NY-1) and Sen. Kirsten Gillibrand (NY-2). You can help prevent this travesty by signing the petition here. Greetings. 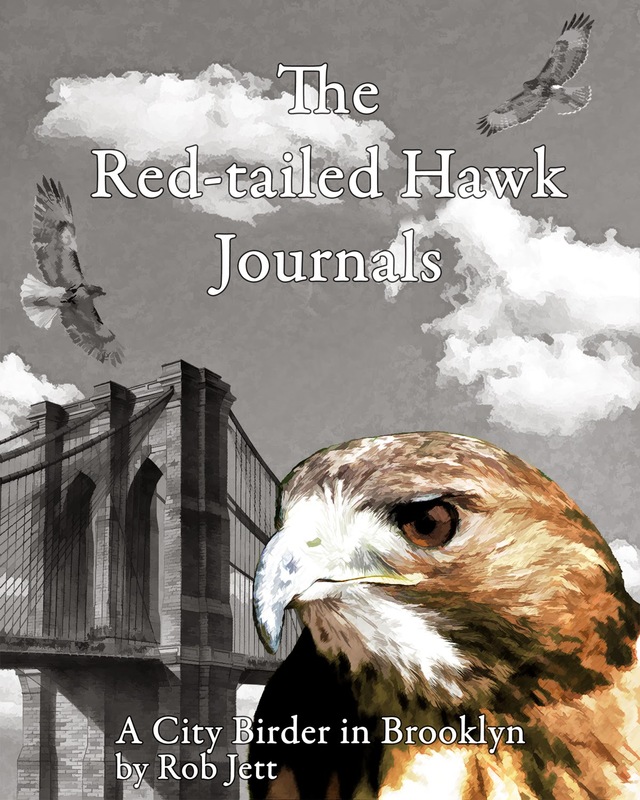 This is the New York Rare Bird Alert for Friday, August 10th at 7:00pm. The highlights of today's tape are AMERICAN AVOCETS, MARBLED GODWIT, WILSON'S PHALAROPES, WHIMBRELS, and LARK SPARROW. With the conditions on the East Pond at Jamaica Bay Wildlife Refuge still very good for shorebirds, it was not surprising that last week an AMERICAN AVOCET stayed at the north end of the Pond through last weekend. Perhaps unfortunately though, three more avocets showed up on the Pond on Monday, and when they departed Monday night, they took the residing avocet with them. Two WILSON'S PHALAROPES also visited the East Pond Monday, but could not be relocated the next day. Among the other less common shorebirds on the East Pond were a single LONG-BILLED DOWITCHER Saturday, with two on Tuesday, and very low numbers so far of PECTORAL SANDPIPER, WHITE-RUMPED SANDPIPER, and WESTERN SANDPIPER have been occurring. A breeding-plumaged DUNLIN, appearing last Saturday, was an early surprise, and a high count of 84 STILT SANDPIPERS was recorded Sunday. One to three GULL-BILLED TERNS continue to visit the tern roosting island at the north end of the East Pond, and a single ROYAL TERN flew down the Pond on Thursday. On Thursday a LARK SPARROW was reported from Jones Beach West End, the bird noted around the western section of parking field 2. On Friday morning the LARK SPARROW was again around the northwestern corner of lot 2 and was present to at least mid-afternoon, despite being flushed multiple times by passing vehicles. Also reported today in lot 2, in a large gull flock at the eastern end, were eight markedly different LESSER BLACK-BACKED GULLS. Among the birds gathered around Jones Inlet on Tuesday were four LESSER BLACK-BACKED GULLS and a BLACK TERN. Friday morning a sea watch from the Fishermen's parking lot at Fort Tilden netted six WILSON'S STORM-PETRELS and four BLACK TERNS moving past in a westerly direction, and a whale watch into the Atlantic from Riis Landing on Thursday afternoon noted about 25 WILSON'S STORM-PETRELS, plus two humpback whales. Out on eastern Long Island along Dune Road, west of Shinnecock Inlet, the low tide mussel beds and mudflats just west of the Ponquogue Bridge have been attracting one to three WHIMBREL during the week. A MARBLED GODWIT, perhaps the same one seen there the last weekend in July, was noted around the bay island west of the bridge on Wednesday and Thursday. It was still present today, but a bit farther east, frequenting the deep water around the easternmost mussel bed. On the North Fork, Cedar Beach County Park in Southold has been attracting some WHIMBREL for a week or more, and six were counted there just yesterday. This is historically a good location to find WHIMBREL. Last Sunday two AMERICAN AVOCETS appeared briefly on Downs Creek in Cutchogue, quickly flying off to the south. These may have been part of the three visiting Jamaica Bay on Monday. Recent land bird migrants noted in the city area have included several species of regionally-breeding warblers, including BLACK-THROATED BLUE WARBLER, WORM-EATING WARBLER, HOODED WARBLER, and CANADA WARBLER. Double-crested Cormorants are a common nesting species on the islands of New York Harbor. 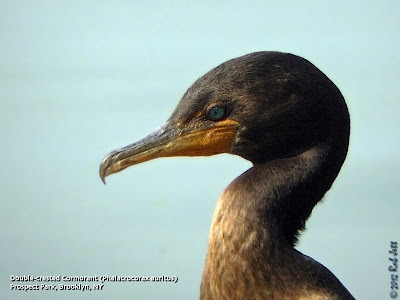 According to the New York City Audubon Society's "Harbor Herons Nesting Survey 2010", "A total of 1,372 Double-crested Cormorant nests were observed, representing an increase from the 2007 total of 1,046 nests and the 2009 total of 1,183 nests." 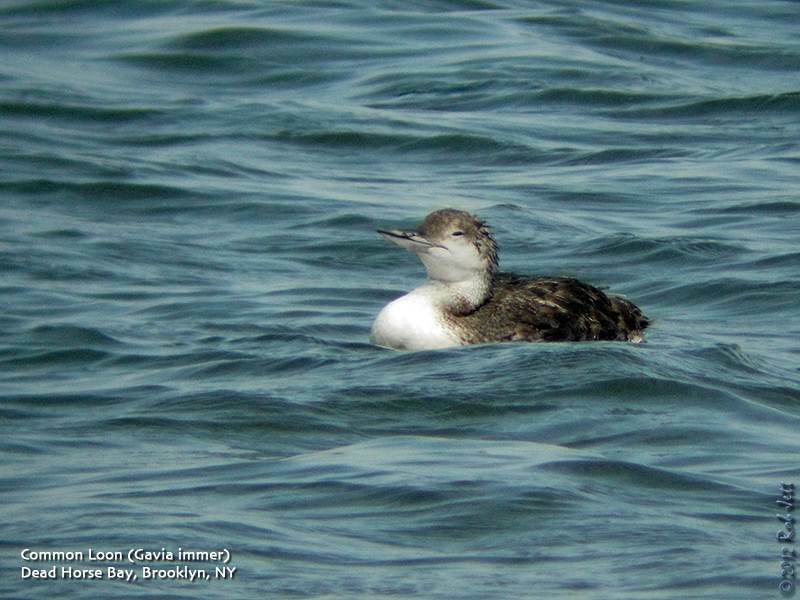 These diving birds can be found around New York City during every month of the year and seem to be thriving likely due, in part, to improving water quality and fish populations. This individual was found drying his feathers at the edge of Prospect Lake in Prospect Park. Over the weekend Heydi and I birded Marine Park and Dead Horse Bay in search of shorebirds, terns and, for that matter, any unusual migrants that might pass through our field of view. Sunday began for me at around 5am. I planned on pedaling the approximately 7 miles to the Marine Park Saltmarsh Nature Center, so wanted to leave enough time for a good breakfast before heading out. Heydi and I met up near her place at around 7am then went over to the marsh overlook behind the center. From there we scanned the shoreline and exposed wooden pilings for birds. A Royal Tern had been spotted there earlier in the week. My wife joked that it was probably the one from last August in search of sports bras. Unfortunately, it didn't have the courtesy to wait around until Heydi and I arrived. Harumph. Anyway, from there we checked out the marsh grass for Saltmarsh Sparrows and shorebirds feeding within the network of muddy drainage channels. I spotted a single Saltmarsh Sparrow as it skittered just above the tops of the grass before disappearing into the vast carpet of green. There were also a few Semipalmated Plovers and Sandpipers in the vicinity. It was getting close to 9am when we decided to head over to Floyd Bennett Field and Dead Horse Bay. Heydi hopped on the Q35 while I hopped on my bike. The flag in front of Aviator Sports was lifeless on its pole and the air at Floyd Bennett Field felt like it was on fire. After a brief break at Aviator for cold drinks and water bottle refilling, we agreed to skip over the scorching grassland and instead walk over to Dead Horse Bay. Passing the summer camp's pool area I spotted a mound of melting "snow" deposited by the indoor ice rink's Zamboni. I scooped out a handful and packed it against the back of my neck. If the mound had been large enough I would have sprawled out on it and made snow angels. Heydi suggested that we walk passed the community gardens and check for butterflies at the border of buddleia shrubs. There were some butterflies present, but diversity was low. Perhaps it was even too hot for these pollinators. At the southern edge of the garden, which is dominated by dried irises and fennel, Heydi spotted a tiny moth called the Chickweed Geometer. My close vision isn't as good as it used to be, so had I been alone would have definitely overlooked this tiny pale-yellow and pink moth. I chased it around for a few minutes trying to take some photos, then we continued towards Flatbush Avenue and the Dead Horse Bay trailhead. 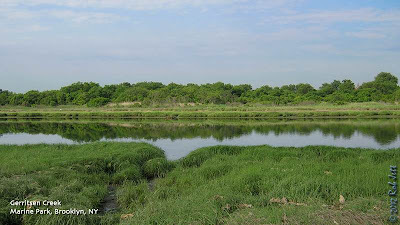 Dead Horse Bay is due East of Plum Beach and across Plum Beach Channel. 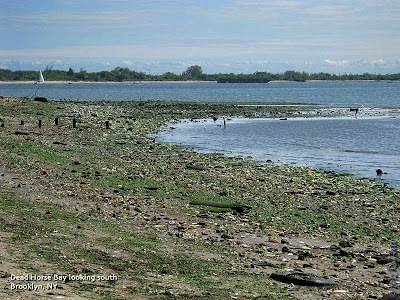 During low-tide there are fairly extensive mudflats at Plum Beach where shorebirds can feed. Unfortunately, there is also a lot of human activity there, including unleashed dogs, disturbing the birds. Some of the migrating shorebirds will fly across the channel to rest and feed along the glass strewn and much less busy shoreline of Dead Horse Bay. A small mixed flock of shorebirds were feeding along the northern shoreline towards the Flatbush Marina. It consisted of Semipalmated Plover, American Oystercatcher, Spotted Sandpiper, Ruddy Turnstone, Sanderling and Semipalmated Sandpiper. The most numerous species was Semipalmated Plover. On the water and fairly close to shore was a female Black Scoter. This individual has been present since, at least, July 14th. Close by was a Common Loon, which is also very unusual to see over-Summering in Brooklyn. The two birds are never very far away from each other and give the impression of a curious avian "Odd Couple" (I wonder which one would be Oscar). 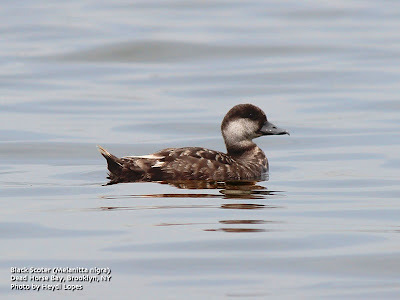 Heydi mentioned to me that the scoter did not appear to be able to fly very well. From the photo it looks as though her feathers are either extremely worn or there are new ones coming in. Perhaps she is experiencing a delayed molt, in which case, she won't be able to fly until the new feathers have completely grown in. 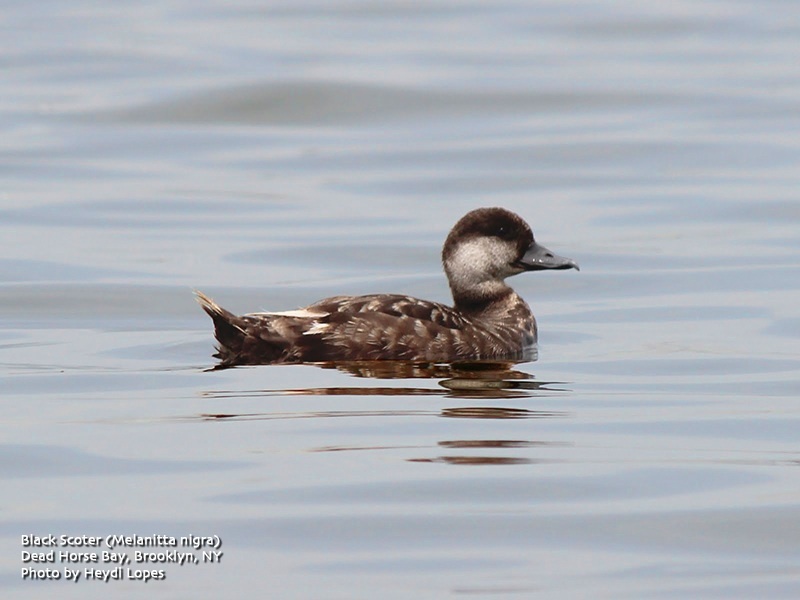 With regard to the Common Loon, I have no clue why this bird, who breeds in extreme northern New York State and across Canada, would opt to remain in Brooklyn. Maybe to keep his little friend company. Many of the sumac trees that line the Dead Horse Bay trail were covered with these pretty yellow and red caterpillars. Neither Heydi nor myself had ever noticed them before. We found it interesting that they were only feeding on the leaves of the sumacs and any adjacent shrubs or wildflowers were untouched. When I got close to take a better look, they would raise their heads in alarm and freeze. 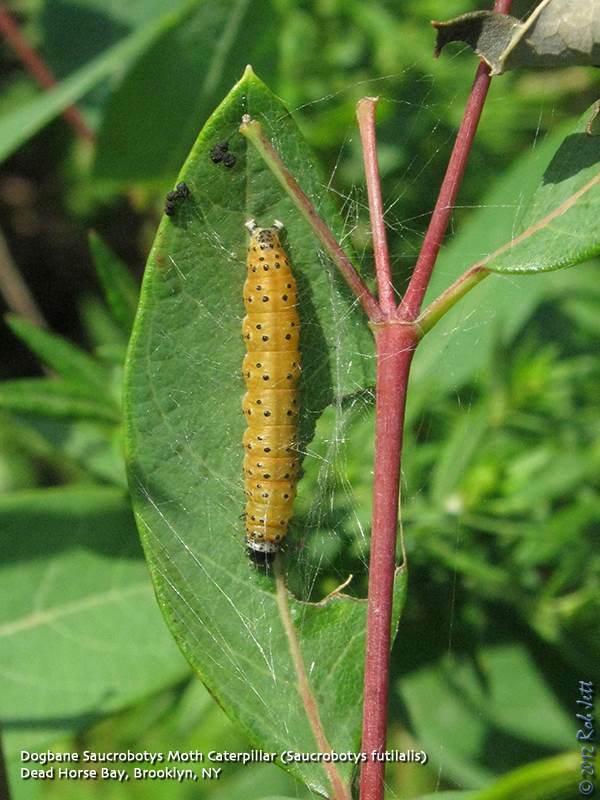 It was easy to research this caterpillar's identity as sumac seems to be a preferred host plant. In fact, I found some referring to the Spotted Datana as the "Sumac Caterpillar". If you follow the previous link you'll find that the adult moth form of this native species is not nearly as pretty or interesting as the brightly colored caterpillar. I couldn't find any information regarding whether this insect is considered a pest, so perhaps not. My bike route home cuts across the Parade Grounds between Caton Avenue and Parkside Avenue. It's usually a very busy spot on weekends as it contains several soccer fields, football fields, baseball diamonds and tennis courts. I either walk my bike here or ride very, very slowly. As I was heading north across the Parade Grounds on Sunday I noticed two teenagers staring down at something on the pavement. I looked down and spotted a large, bright green caterpillar. It was a Polyphemus moth caterpillar. I was so excited that I hopped off my bike in front of them and grabbed my camera. While I was taking some photos I explained to the pair what it was they were looking at and described the huge, beautiful moth that it turns into. They smiled and walked away, mumbling something in Spanish. I'm guessing it was something like, "That guy is weird." 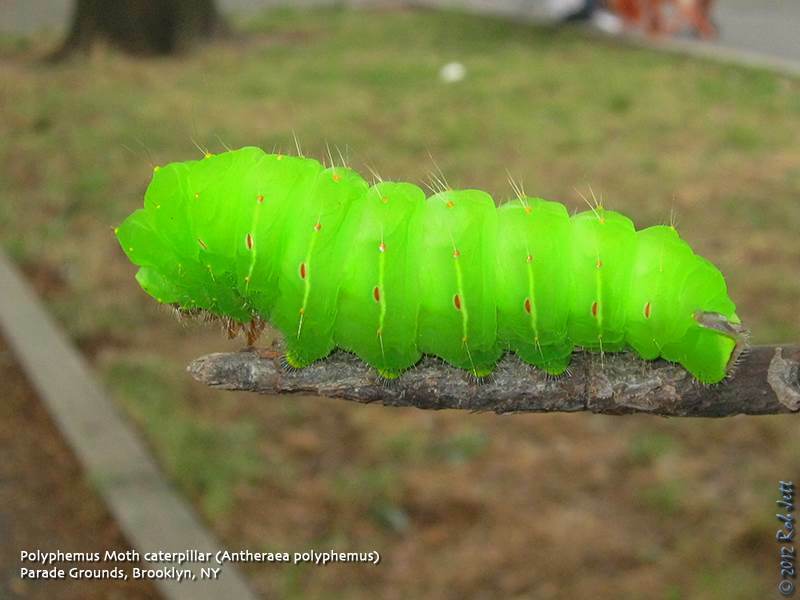 I've only seen this caterpillar once before, in Green-Wood Cemetery and I've never seen the adult moth. If I left the caterpillar anywhere in the Parade Grounds it would have been flattened by the end of the day. I picked it up, stuck it in my bike trunk and continued riding to Prospect Park. At a dense, brushy area, not far from the lake, I released him/her. I was thinking about going back and looking for its cocoon. At this point in the year, the pupa may overwinter and not hatch until next Spring.